Hasti Public School Dhule (Hasti Public School), Dhule published a new job notification for Pre-Primary Teacher, Primary Teacher, Secondary Teacher & Counselor, Warden, Doctor Nurse, Peon, Security Guard Posts. The recruitment is for total 20 Vacancies. The willing candidates are informed to see the latest notification March 2019. Walk-in-Interview on 22nd March to 24th March 2019. 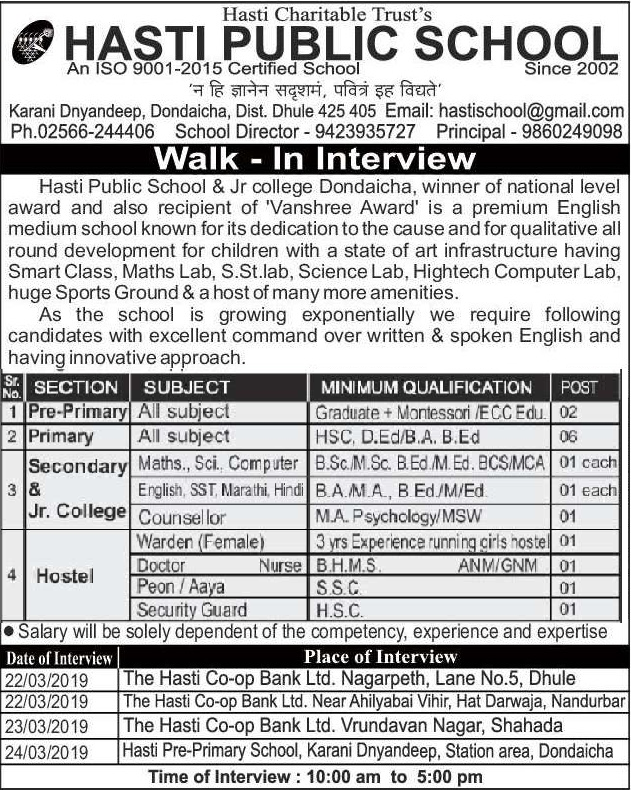 For More details of Hasti Public School Dhule Recruitment 2019 Read Below. Application starts offline 18-03-2019. Last Date of application is 31-03-2019.